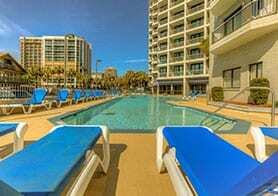 About Garden City South Carolina | Oceanfront Vacation Rentals Inc. Located just 7 miles south of Myrtle Beach, the coastal town of Garden City feels worlds away. 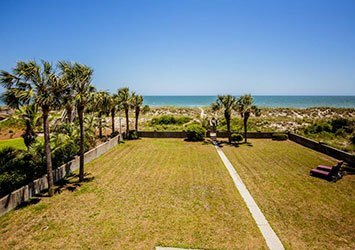 This classic small beach town features pristine vacation homes and rentals, a beautiful beach, and a few shops and amenities, but it is quiet enough for Grand Strand vacationers to relax and enjoy the South Carolina shoreline at a quieter pace. 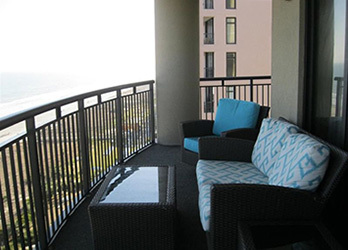 While the pace might be a little slower in Garden City, for vacationers who want to relax in the sun, enjoy a fresh seafood dinner overlooking the ocean, or dance the night away on the Grand Strand’s favorite pier, this community is just a few miles from Myrtle Beach and could become your favorite beach bum paradise. One of the most notable attractions in Garden City is the Fishing Pier, officially named the Kingfisher Pier, and designated as the “Best Pier” by “The Sun News” for 5 years in a row. At 668 feet long, there’s plenty of elbow room for anglers, and taking a stroll down the long pier to take in an oceanfront view is free. On the pier premises, you’ll find the Pier Café which serves breakfast, lunch and dinner, an arcade, and a tackle shop. The pier has a bit of a rocky history. In 1954, Hurricane Hazel hit the area and proved to be one of South Carolina’s most destructive storms, and the Grand Strand was forced to rebuild. The Garden City Pier took a heavy hit again in 1989 when Hurricane Hugo devastated the pier, and it had to be completely reconstructed. Rebuilding started in 1992, and since its grand reopening, the pier has been standing tall for thousands of visitors to enjoy every year. While the Kingfisher Pier is one of the most sought out fishing piers, the Myrtle Beach area offers several other fantastic pier fishing options. Here’s more information to help you discover the abundance Myrtle Beach fishing piers around Garden City. The Pier isn’t the only attraction in Garden City. The community is also home to the landmark Sam’s Corner, a 24-hour restaurant that is world famous for their hot dogs and diner-style interior. There are plenty of other locally renowned restaurants for hungry beachgoers as well, including Sara J’s, a waterfront seafood restaurant, the oceanfront Conch Café, and the Yum Yum Shop ice cream parlor. For fun off the sand, visitors can also head down to the Pavilion Arcade for a round of skeeball, check out the Maze Mania, which features fence mazes that change every day, and grab a new board at The Village Surf Shop, which has been building surfboards for locals and visitors alike for over 40 years.